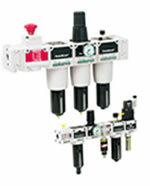 Numatics Filters, Regulators, Lubricators (FRL) and Accessories include a comprehensive line of Modular FRL Components & Assemblies, Miniature FRL Components, High Flow Premium Filters, High Flow FRL Components, Stainless Steel FRL's, Proportional & Precision Regulator Instrumentation, Lockout Valves, Digital Pressure/Vacuum Sensors, FRL Accessories, Fittings, Flow Controls, Mufflers & Tubing. The Numatics Miniature FRL 12 Series is perfect for applications needing clean air in a limited space. The black anodized bodies are made from light weight aluminum and are durable enough to be used in almost any application. Standard range is 0-125 Psig. The Numatics Modular Flexiblok offers a square head design with integral mounting holes simplifying mounting by eliminating brackets. Direct connect modularity mounts one component to the next with a single O-Ring seal and two screws eliminating adapters and therefore cost and potential leak paths. Numatics lockout valves prevent unauthorized pressurization of an air system during service or maintenance. Numatics lockout valves employ a unique, one piece center spool design that accommodates a user-supplied padlock in the closed position. Numatics DPS / DVS 280 series digital sensors can be used as a digital pressure / vacuum gauge for accurate visual display of the current value. They can also be used as a controls device. Numatics Pressure Gauges, Pressure Switches, Pressure Regulators, Air Mufflers, Vent Silencers, Check Valves, Lockout Valves, Breather Vents, Speed Controls, Quick Exhaust Valves, Tube Fittings, Tubing.